John Burke (b. 1818 in County Tipperary, Ireland and died 1888 in Clinton County, Iowa. 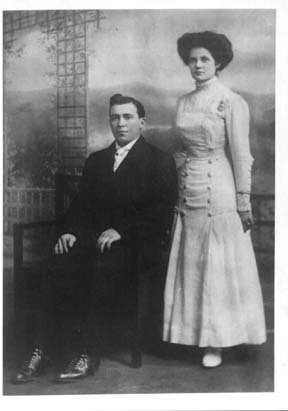 Brother of Edmond, William, Elizabeth) with wife Nancy Quinlan Burke. This portrait remains in the home of their descendants in Clinton County, Iowa. Edmund Burke (b. 1883 Andover, Iowa) and Mary Gertrude Eleanor Tucking Burke (b. 1885 Lyons, Iowa)Married November 10, 1909, Clinton County, Iowa. 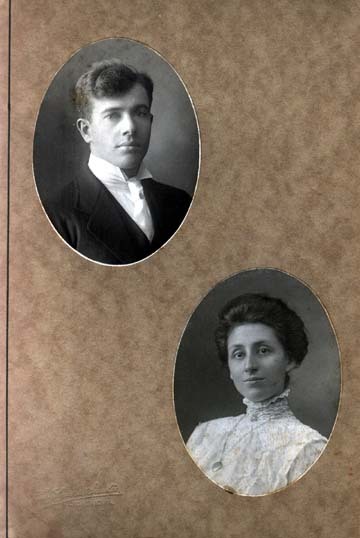 James Isadore Meighan (b 1886 in Clinton County, died in 1989 Fayette, Iowa - grandson of John and Nancy above) and wife Margaret Costello. The Burkes of Clinton County Iowa - a Short Family History.